An ongoing dispute involving rapper and entrepreneur Jay-Z and a brand management company that’s set to be heard before the American Arbitration Association has pointed the spotlight on how critical it is to have arbitrator diversity. In November Jay-Z asked the Supreme Court of the State of New York – in a filing under his legal name, Shawn Carter – to halt arbitration proceedings initiated by Iconix Brand Group over a trademark and contract dispute against him because there were not enough eligible African-American arbitrators to hear the case. Jay-Z was “confronted with a stark reality” involving the AAA’s “blatant failure" to ensure diversity, especially given the “prevalence of mandatory arbitration provisions in commercial contracts across nearly all industries,” according to the petition. On January 30, the Supreme Court of the State of New York ordered the respondents to show cause why the arbitration shouldn’t be halted. But later, on January 30, Jay-Z’s lawyer – Alex Spiro, a partner at Quinn Emanuel Urquhart & Sullivan – told the court the AAA has allowed the dispute to be heard by a three-arbitrator panel instead of a single arbitrator, and offered five African-American candidates. 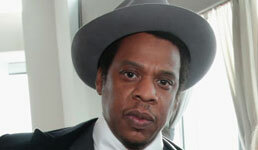 That concession was enough for Jay-Z’s legal team to proceed with the arbitration. Arbitrator diversity is an issue that Finra’s Office of Dispute Resolution – which administers the self-regulator’s independent arbitration and mediation forum – has been dealing with for several years. Richard Berry, New York-based director of the Office of Dispute Resolution, says arbitrator diversity has been his “absolute number-one priority” since taking on his role on Dec. 1, 2014. Berry says Finra is fully aware of the importance of having a diverse set of arbitrators and reiterates that this has been a long-term goal. Under Berry’s guidance, Finra has been monitoring, working to improve and making publicly available diversity statistics of its arbitration and mediation forum. 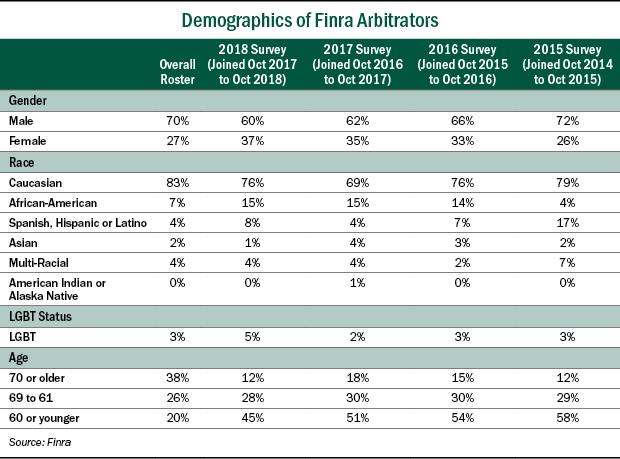 Using a third-party research provider to monitor arbitrator diversity, Finra data shows the percentage of females, African-Americans and LGBT persons among new arbitrators has increased from 2015. Yet the percentage of Spanish, Hispanic or Latinx arbitrators has declined over the four-year period. Looking at the past year’s data alone, there have been increases in the percentage of new arbitrators in these categories: female; Spanish, Hispanic or Latinx; and LGBT individuals. The percentage of new African-American arbitrators was unchanged over the past year. 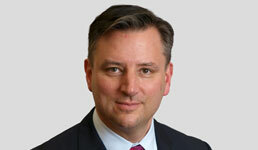 “This is something we have been working on for a long time, and it’s part of our effort to continuously improve. You know, at the end of the day, we will never be done improving this program,” Berry tells FA-IQ. Berry says Finra has been publishing arbitrator diversity data since September 2017 to be “100% transparent” about its progress. “It’s important to show that we’re not just talking the talk. We are walking the walk,” he says. A spokeswoman for AAA tells FA-IQ that the group also has a “multi-year undertaking to increase the gender and ethnic diversity” of its arbitrator roster, which is currently 24% women and minorities. She didn’t break down the stats to show how many arbitrators are women and how many are other minorities. Using Jay-Z’s case -- where he specifically wanted more eligible African-American arbitrators -- as an example, FA-IQ asked Berry if he believes it’s important to have diversity matching among arbitrators and parties in an arbitration case. If you’re an African-American party in a case, should there be an African-American arbitrator hearing the case? The same question could be asked for any type of minority, such as females, Hispanics, LGBTs, FA-IQ posited. Berry says it’s not about having diversity matching between the actual arbitrators selected and a party for a case, but it’s all about the pool of arbitrators. “I think it’s important for the program to have a diverse group of arbitrators to choose from, and so we strive to make sure we have diversity,” including different demographic and employment backgrounds, he says. Having a more diverse pool of arbitrators in Finra’s arbitration forum “adds to the fairness” of the process, Wells Fargo managing counsel Beverly Jo Slaughter said at the Practising Law Institute’s Securities Arbitration 2018 forum in September. Just like AAA, however, arbitrators chosen by parties to form a Finra arbitration panel come from lists automatically generated using algorithm tools. To assign arbitrators to cases, Finra uses a “neutral list selection system” computer algorithm to randomly generate lists of 35 arbitrators from its arbitrator roster. The number of lists generated and the number of arbitrator names per list depend on the specific case type. Once the neutral list is produced, each party can try to whittle the list down using their own selection criteria. When it comes to cases involving investors, cases between broker-dealer firms, cases where both parties are brokers, or when one party is a broker and another is a broker-dealer firm, the cutoff for the number of arbitrators decided on a case is $100,000 in claims. In all three scenarios, cases with claims of up to $100,000 are decided by one arbitrator, while cases with claims of more than $100,000 are decided by three arbitrators. FA-IQ asked Berry if Finra’s arbitration forum would be able to make adjustments in the same or a similar way to AAA’s recent decision to allow the dispute involving Jay-Z to be heard by a three-arbitrator panel instead of a single arbitrator, and to offer five African-American candidates. Berry stresses there are rules that must be followed in Finra’s arbitration forum, and that includes arbitrator selection. He believes the randomly-generated lists will offer enough diversity. But if they don’t, he says there is room to be flexible. “We also listen to our parties. If the parties can stipulate to other procedures they’d like us to use in arbitrator selection, as long as it’s feasible for us we try to accommodate those requests,” Berry says. Meanwhile, in line with Finra’s efforts to improve arbitrator diversity, the Office of Dispute Resolution has been working with a recruitment team focused on 100 professional organizations nationwide, according to Berry. Last year, arbitrator recruitment events were held with various groups including the Asian American Bar Association of the Greater Chicago Area, the Metropolitan Black Bar Association, the National Lesbian and Gay Journalists Association, the National Association of Women Business Owners, and the Society for Advancement of Chicanos/Hispanics and Native Americans in Science. This year, arbitrator recruitment events are planned with groups including the National Association of Black Accountants, Alpha Kappa Alpha Sorority, the National Association of Blacks in Criminal Justice, the Women’s Business Enterprise National Council, and the National LGBT Bar Association.